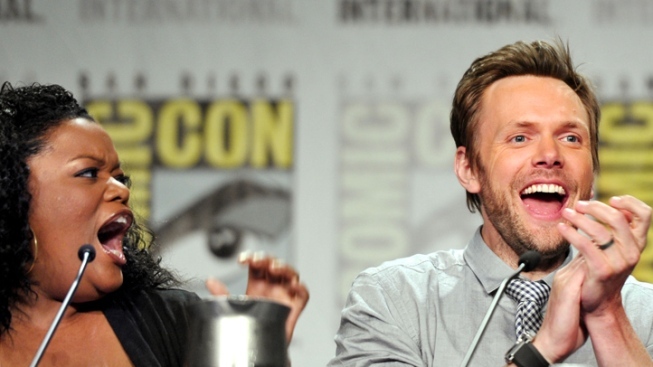 Yvette Nicole Brown and Joel McHale will speak at the "Community" panel Friday, July 13. Comic-Con International's second day offers some thoughtful panels and a preview of some of fall's expected hits. Joel McHale, Gillian Jacobs, Dani Pudi, Yvette Nicole Brown and Alison Brie hit the convention center in advance of season four, which premieres on NBC Oct. 19. The cast will field questions and reveal what's in store for the group come fall. Zombie aficionados and those who love them will throng to this event. AMC's "The Waking Dead" castmembers Andrew Lincoln, Sarah Wayne Callies, Norman Reedus, Steven Yeun and Lauren Cohen will be joined by newbies Danai Gurira (as Michonne) and David Morrissey (as The Governor) will offer up a sneak peek at season three and answer fan queries. Queer cartooning has a storied history at Comic-Con and this gathering will celebrate the launch of a new anthology celebrating 40 years of LGBT stories, characters and creators. "No Straight Lines" showcases lesbian underground comics to trans web comics and almost everything in between. Moderator (and anthology editor) Justin Hall chats with an all-star panel including Paige Braddock, Alison Bechdel, Ed Luce and Eric Shanower. "Total Recall," "Looper" and "Elysium"
Sony Pictures deliver their A-listers for this panel and preview of their biggest summer and early fall releases. Colin Farrell, Kate Beckinsale, Bryan Cranston ("Total Recall"), Emily Blunt, Joseph Gordon-Levitt, ("Looper") and Matt Damon and Jodie Foster ("Elysium") are scheduled to appear. Presented by SyFy, the 24th annual Eisner Awards honors comic creators and work published in 2011across 28 categories. Special guest presenters - this year's roster includes George R.R. Martin ("Game of Thrones"), British talk show host Jonathan Ross and actress Erin Gray ("Buck Rogers") - will hand out the awards at what is often referred to as the Oscars of comics.